Administrativ@mente was born in January 2009. The primary aim of the journal is to contribute to the study, research and to the discussions about administrative law and organizational models and functional of public administrations with essays, articles, notes and documentation legislation, case law and administrative, from scholars, jurists and practitioners. The Bulletin of CILEA (ISSN 1120-2440), was a periodic publication by CILEA to inform users about strategies, services and activities provided. As of September 2012 it was merged with in News from CINECA (ISSN 1723-5251). 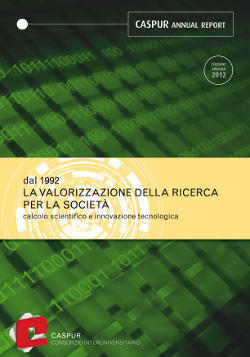 "CASPUR-CIBER Publishing - Sustainable publications" publishes digital and open access scientific, multimedia and educational material provided by associated Universities and other public research institutions. For each publication, an environmental restoration will be made in protected or sensitive areas with native or local plants. This issue is a collection of scientific articles coming from different research areas. It presents contributions CILEA users have realized with the aid of the computing platforms mantained by CILEA. Symphonya. Emerging Issues in Management is the online management journal edited by University of Milan-Bicocca and published by the same University. Founded in 1999, and thanks to the active participation of leading academics and managers as well as the high presence on search engines, Symphonya is a leading outlet for academics and managers on emerging issues in management and global markets.